So the other day my monohull sailor buddy finally takes the plunge and buys a cat, an '83 Prindle 18 that is in need of TLC and God knows what else at this point. While inspecting the main I noticed a couple of missing battens, 3 and 4 from the top and that the sides of all the battens were flat along the entire length instead of rounded like Hobie battens, factory no tapering. I really didn't notice any file or tool marks. Are the flats OEM on Prindle battens or have these indeed been worked? Note that this is my first really close look at a Prindle. Will do. The main that came with the boat looks OK, first blush, but we haven't had it up yet. 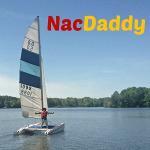 i have same condition battens on 4 sets of prindle 16 sails offered for sale on this site I place electric tape tightly over front edge that sits inside batten cap so it sits snuggly and does not deteriorate further, the battens are off white or blue and still resilient and have held up better than Dart battens that are often hallow, hobie battens also have held up over time eg from my hobie 16 sails from 1971! they are interchangeable with prindle battens when you can 'size' them up; use a hack saw to get precise size and drill a new hole if necessary to lace or preferably new end cap. Thanks John for the confirmation on the side flats being OEM. I will need to find some batten stock with the flatted sides to replace the two that are missing which are 79" and 84". These could be cut down from longer battens of the same section. Anyone have battens of the needed or longer length you would consider parting with? I have some from a H 17 that could be cut down. They are currently 87 and 94 inches with caps. Find myself with 2 extra sets of battens at the moment. Wilmington NC. or, fit the sail with all Hobie battens as a starting point. If you have some OEM Prindle battens with the flats that's what I'm looking for. i would spend as little as possible on things like battens, paint, etc, and save the money for real needs (rum, sunscreen, etc)... well kinda kidding about that but i would get the boat sound, in the water, and working before purchasing anything expensive. Make sure the user loves sailing, and has the skills to notice the difference from an oem batten to a 1979 mismatched off brand batten that will "work for now". not to mention sail shape and when to use different stiffnesses of battens. Guessing some of these battens might work. Nice find and only about an hour and a half from me. I'll check it out thanks.